Alice Sutter can’t remember a time when she wasn’t sewing or quilting. She is among four generations of quilters (her grandmother, her mom, herself and her daughter). Her grandmother had a quilt frame that filled an entire room and Alice played under it. When she was eight, her grandmother taught her how to embroider. Today, Alice always has several embroidery projects underway because she finds so many patterns that inspire her. “I love handwork because I have busy-hand syndrome and it helps me relax in the evenings,” she says. When Alice was in high school, she started quilting. She observed a lot from the quilters in her family and learned to experiment, so she is never afraid to try something new. There is always a quilt on her quilt frame at home, ready to be worked on even it’s just a few minutes a day. Patchwork and scrappy quilts are her favorite. She also does applique and usually has everything going at once—embroidery, hand quilting and applique. Diane Dixon is a Valley Girl from California who started sewing at an early age. Her first machine was a toy with a crank that made the needle go up and down. (It actually did sew!) Later, her mother made her sew on lined paper using an unthreaded machine, so that she would learn how to sew straight. Diane started quilting, a bit by accident, once she moved to Sedona. 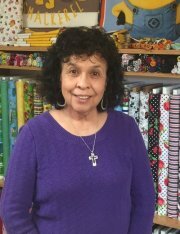 Her niece had left her blanket in California, so Diane stopped in the Quilter’s Store hoping to buy a ready-made quilt. The owner suggested that she should “just make one.” Diane left the store with fabric, a cutting mat, supplies and a vague idea of what she was going to do. Today Diane’s passion is making Bargello quilts, which are made of many strips of fabric sewn together to create movement. Her knack for choosing colors and establishing patterns is what makes her quilts unique. Over the past 10 years, she has made 30 bargellos with some selling for up to $1,500. Jill Boyd (a.k.a. The Quilt Chef) began quilting in 1992 when a friend loaned her “The It’s Okay If You Sit on My Quilt Book,” by Mary Ellen Hopkins—along with a rotary cutter, mat and ruler. She drafted her first quilt design on graph paper and used a half-inch seam allowance. A year later, she took her first beginning quilting class. Later, Jill found herself personalizing off-the-shelf quilt patterns. This was more inspiring and fun than simply “following the directions.” Soon, she was creating her own designs and teaching classes to customers. 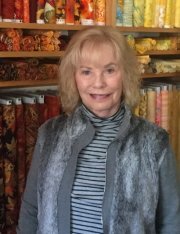 As her signature style developed and her quilt samples hung in the shop, customers began asking for published patterns and a new business was born. Jill became The Quilt Chef and started cooking with color. 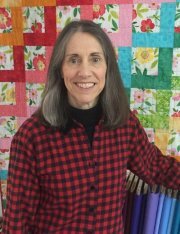 Today, she whips up quilt pattern recipes using a variety of fabric ingredients from her stash pantry, and spices up traditional quilting by experimenting with new quilt utensils and techniques. A designer by nature, Jill creates geometric patterns that reflect her favorite style of quilting, machine piecing and machine quilting. 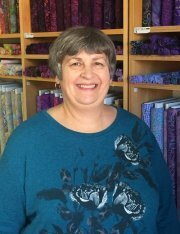 She has worked at the Quilter’s Store since 1993 and is a huge contributor to its ever-changing fabric collection and displays. Jill enjoys demonstrating the latest tools and techniques, and loves to help other quilters cook up their next quilt projects. Her husband’s maternal grandmother, Louisa, was a quilter who gathered fabric scraps from a local mercantile to make quilts. Maggie’s mother-in-law inherited the quilts and spent hours sharing stories about them. Maggie fell in love with the designs, fabrics and quilting styles used. Today, these quilts are all in her possession. Maggie likes all aspects of the art. She gravitates towards piecing and appliqué, and has expanded her horizons to include art quilts—landscapes, whimsical designs and challenge quilts. Juvenile fabrics also speak to her, especially those with baseball themes, insects, bats, dinosaurs and space. She is now teaching her two grandnieces to quilt. Maggie has worked at the Quilter's Store since 2013 and makes many of the sample quilts hanging on our walls. She enjoys putting together color palettes for customers. “It is so much fun and rewarding to see patrons come back with their finished projects, and know that you assisted in their selection of fabrics,” she said. Sheryl Bertelson grew up with a mom who sewed a lot (clothes, drapes, slip covers, etc.) but never quilts. As a child, she learned to embroider, sew simple clothing, knit and crochet. 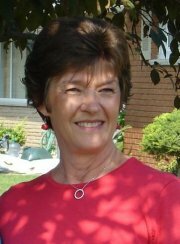 After she moved to Sedona, Sheryl met a woman who invited her to a meeting of the Red Rock Quilters. It looked interesting, so she got involved in a “Mystery Quilt” activity the group was doing. Her new friend Joyce helped her select the required quantity of three fabrics—a light, medium and dark. Each month, the participants received one or two different block patterns to make from those fabrics. Sheryl made her first quilt, a queen size sampler, using twenty different blocks. She was hooked.